First, prep the cookie dough. Cream the butter and sugar together until pale in color. Then, slowly whisk in the beaten eggs a little bit at a time. Once combined, add in the flour, baking powder, and matcha powder. Form the cookie dough into a log and wrap it in plastic wrap and allow to set in the fridge for an hour. The cookie dough will be the "topping" for your melon pan. While the cookie dough is setting, prepare the bread dough. First, preheat the oven to 340F. Then, activate the yeast in the warm water and a bit of the sugar so the yeast has something to eat. Once it starts foaming, add in the dry milk powder and the beaten egg. In a separate bowl, combine the bread flour, rest of the sugar, and salt. Slowly add in the wet ingredients. Combine with a wooden spoon until a sticky dough ball forms. Knead the dough until it becomes more tacky. Then, add in the softened butter and knead it into the dough. Knead until the dough his no longer sticky to the dough and it looks smooth and glossy - about 8-10 mins. Form the dough into a ball and allow to rise for about 40 mins or until doubled in volume. Punch out the air from the dough and cut separate the dough into 4 dough balls. Use the remaining dough to make smaller dough balls for the turtle's head and limbs. Once done, allow to rest for 20 mins. After it has rested for 20 mins, add the cookie dough to the bread dough to form the turtle shell. Dip the turtle shell in sugar and then score in the turtle shell pattern using a bench scraper. Assemble the turtle and allow to rise for another 40 mins. Bake the turtle bread for about 12 mins or until slightly browned. Allow to cool. Give the turtle a face however you'd like - I piped melted chocolate to make my turtle's face. Adorable! 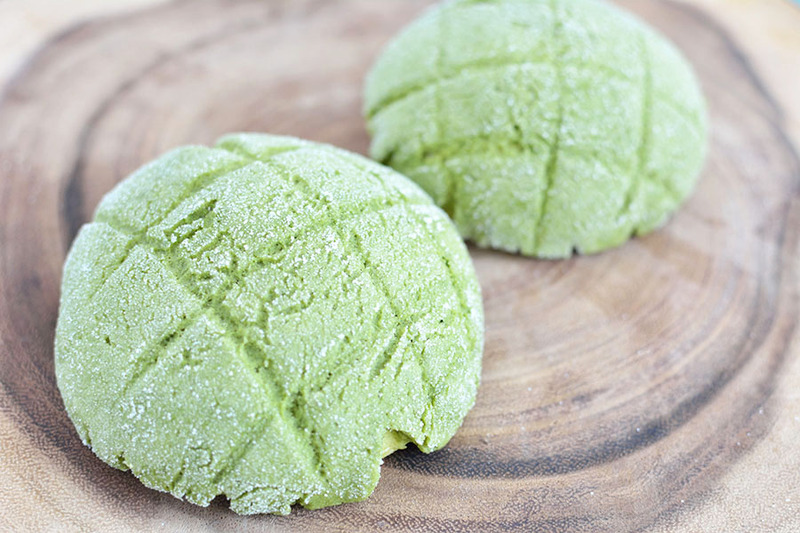 I’ve never had matcha flavored melon pan. That’s so incredible that you made them yourself. I wish I had those baking skills! Hi I have 2 questions, how many turtles does this make?in step 8 you say to divide dough in 4 then use extra dough to make head and legs? Also how thin should I roll out my cookie dough, is it divided in 4 as well? Hi yes I should have clarified.. ultimately this recipe will yield 4 turtles. However, when separating the dough balls, you will have 5 in total – the 5th ball will be a bit smaller than the rest and is used to to help assemble the head, limbs, and tail of the 4 turtles. For the cookie dough, divide in 4.